February | 2014 | We Can't Hear the Mime! Despite being made nearly two years ago Ginger and Rosa remains Sally Potter’s most recent film. 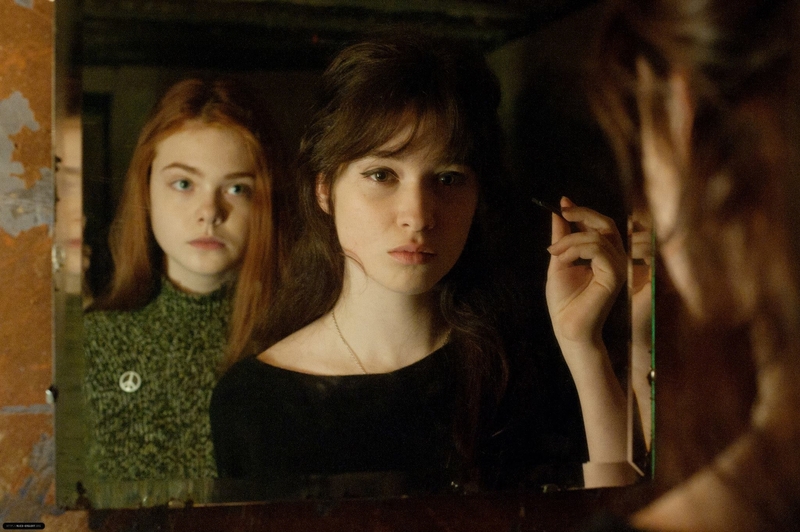 The story revolves around two 17 year old girls, Ginger (Elle Fanning) and Rosa (Alice Englert). The first twenty minutes or so establish this deep friendship through a music-video style collection of images. The girls wear the same clothes, they hold hands all the time and their hair blows in the wind together, mixing together as if they were one etc. The casting of Fanning is completely incomprehensible. Quite apart from an English accent that would seem forced and proper if you were having tea with the Queen in the 1930’s she was at most fourteen at the time of filming. I’d say that just visually those three years are crucial, let alone emotionally. It’s simply not believable that these two girls are the same age. What’s worse, the character arcs emphasise this glaring age difference. On the beach, in their matching jumpers, Ginger is being demure and writing poetry. Rosa is, shockingly, being interested in boys and make up. How these two girls apparently got to age 17 without any of these things ever being issues before is a mystery. Yes it was perhaps a more innocent time but I’m really not convinced that any two teenage girls have ever worn identical outfits voluntarily, unless they were twins trying to re-enact The Parent Trap. Potter very clearly identifies with Ginger, one could say that the character is an embodiment of her teenage self. We too are meant to sympathise with Ginger in the series of events that tear her life apart. The trouble is, Ginger just doesn’t have anything to recommend her. She is painfully passive. When her parents’ marriage is falling apart she is self-absorbed to the point of cruel. Upon hearing her father, Roland (Alessandro Nivola), crying in the middle of the night she does absolutely nothing, writing it off as a normal occurrence. How can we in any way sympathise with her later possessiveness and jealousy over this man that she ­demonstrates absolutely no care for? Granted, Rosa’s attempts to connect with Roland and her eventual relationship with him are also very self-centered, but we’re not expected to identify with and feel sympathy for Rosa. Ginger, on the other hand is shown as a perpetual victim. Rosa’s actions supposedly send her on a downward spiral of risky behaviour to the point of imprisonment. Yet, through all of this she has not made any attempt to stop the relationship between Rosa and her father, in fact she facilitates it by neatly taking herself out of the way whenever the situation arises. At one point she even politely backs away so that Rosa and Roland can fully enjoy each other’s company without her seeing it. It’s not as if Ginger is a shy, retiring type. In fact, the other half of the plot circles around her passion and activism in the face of threat. She becomes a protestor against the nuclear bomb and is determined to protest to avoid the total destruction of the world. The parallel drawn in the film between the threat of nuclear war and Ginger’s tempestuous home life falls flat because of the total personality transplant Ginger undergoes in different aspects of her life. 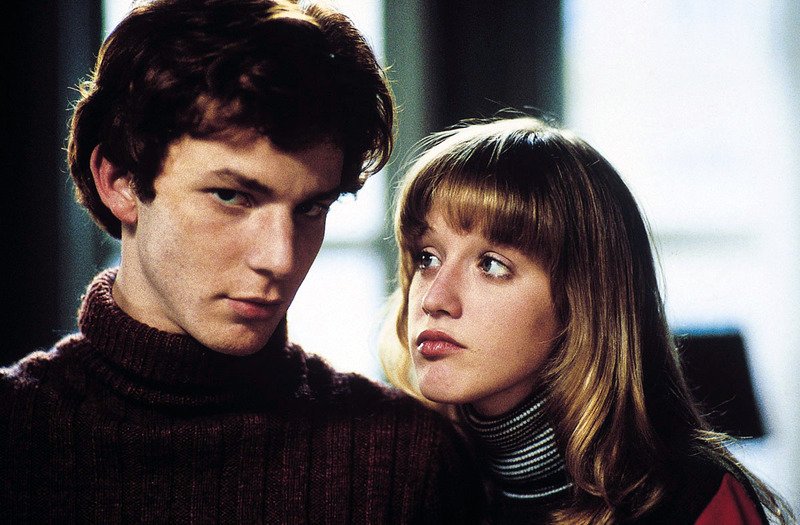 It seems unlikely that the non-confrontational wallflower, who allows her best friend to pursue her father, would be a front-line activist and vice-versa. This is where the blatant age difference really destroys the film. Ginger is acting like a whiny, passive, entitled child. Rosa’s character is much more appealing, she seems to genuinely be moving forwards, trying to form a caring relationship, dealing with the loss of her own father and at the end deeply regretful of the pain she has caused. Why is this girl painted as a villain and a harlot? The message it seems to send is a cautionary tale against low cut tops, since they are clearly gateways to make up and to causing major psychological damage to your best friend. The truth is that there is a great story here, but it’s not the one that is told. From another angle this would be an against-all-odds love story. A sort of modern tragedy where despite all efforts the couple just can’t limit the fallout. The problem lies entirely with Ginger, it’s difficult to say whether it was Potter’s script and identification with the character, or Fanning’s stilted and one-dimensional performance that makes her so problematic as to kill a promising film but either way, it happens. Ginger and Rosa feels like the equivalent of making Star Wars entirely about how R2D2 is affected by the events, it’s interesting but seems to miss the point. This entry was posted in Film Reviews and tagged Alessandro Nivola, Alice Englert, Elle Fanning, Film Review, Ginger and Rosa, Sally Potter on February 26, 2014 by Flo. It’s difficult to review a film you know so much about. In my time as a film lover I had somehow, until today, skipped over watching Hitchcock’s most often cited work, but had not avoided countless documentaries showing and analysing various key images from Vertigo. This meant that, added to the suspense and mystery inherent in the film, I spent the whole film in a state of perpetual déjà vu. Strangely I don’t think this detracted from my experience significantly. Given that one of the themes of the film is doubling ambiguous personality, the pervasive and familiar imagery heightened the unease. As the characters on screen fall into endless spiral patterns, the modern viewer, saturated with the imagery, falls into their own memories. Hitchcock is well known as a perfectionist with every shot planned months before it was even potentially going to be shot. Personally, I find that this leads to a very dry execution. His technique is so perfectly honed that it loses all spontaneity . Like spending time with an exquisite automaton, it’s just missing heart. However, that doesn’t detract from the technical masterclass that is Vertigo. It felt like when I first watched Citizen Kane and understood the dynamics of camera angles. In the case of Vertigo the sets, angles and movements are all conceived for the purpose of making the film feel vertiginous. The predominant colour scheme is green and red, two complementary colours. The juxtaposition is like on a hypnotist’s spinning wheel, too much of it and anyone would start to feel sick. Earlier in the film this is tempered by the calming, hopeful yellow influence of Midge’s clothes and Scottie’s apartment. As the plot thickens these colours disappear to be replaced with the giddy red and green, the only break being the bleak blues of the sanatorium Scottie resides in. The colours program condition the audience, we see a green car and know who should be driving it. When Scottie sees a woman in a green dress we know she is important without thinking. Despite the huge number of doubles that have worn the same clothing as Madeleine the girl in the green dress sticks out. The colour translates the character’s essence, rather than just the physical resemblance the other doubles had. 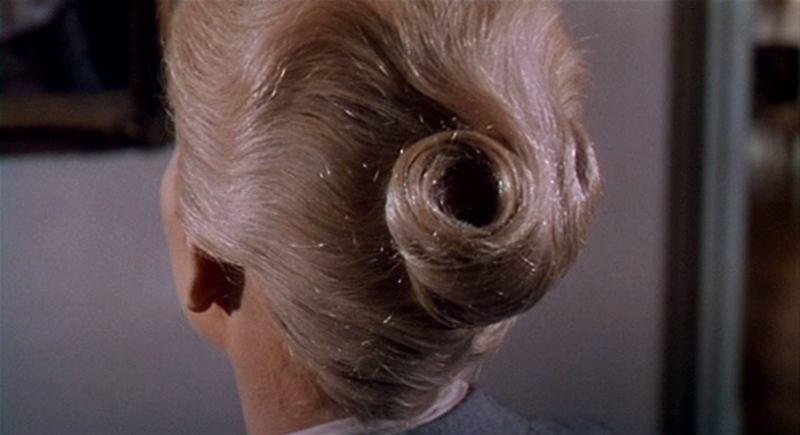 Kim Novak’s hair and make up change so drastically that even the viewer is unsure whether it really really is the same girl. With such a discrepancy in appearance being necessary to the plot the only link she has is the colour green. Surely it is astounding that a filmmaker can, in less than an hour establish a character so irreversibly linked to a colour. Much of the framing in the film includes a frame within a frame, each progressively smaller, wallpapers are picked that have swirls and spirals on them. It’s no coincidence that the chase sequence using the iconic dolly zoom is in a spiral staircase. Not only do these shapes evoke a feeling of falling into a loop but they are doubles of each other, copies and lesser clones like the ones that haunt Scottie in the latter half of the film. Scottie feels as if the whole world is filled with fakes and replicas and so, with him as protagonist, Hitchcock shows us the world through his eyes using the organic patterns that litter the film. When Scottie has a dream about the events of the film it is rendered onscreen as a series of shapes and colours, wordless and emotionless. This sequence epitomises the whole film, a story told in the intellectual reactions to pattern and colour rather than through the script. It’s one of few films that try to abandon spoken language in favour of filmic grammar. It’s a remarkable example of cinematic tradition but it’s not going into my list of favourite films any time soon. This entry was posted in Film Reviews and tagged 1958, Alfred Hitchcock, Barbara Bel Geddes, Film Review, HItchcock, James Stewart, Kim Novak, Tom Helmore, Vertigo on February 13, 2014 by Flo.